from the www.radio.nl site, september 10th, 1999: The National Police Squad (NPS) has arrested a gang that produced and distributed illegal cds. A group of 12 suspects was, according to the NPS, active since 1995. The organizations total production over that period is estimated to a total of 100 million Dutch Guilders (about 45 million Euro). Over four hundred officers, members of the justice department and coworkers of BUMA/Stemra worked side by side at Wednesdays action. They did searches at 50 different locations in Holland. 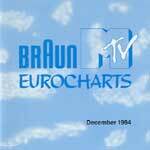 The gang produced the illegal cds with collections of popular music under the names Braun MTV Eurocharts and Hitexplosion.